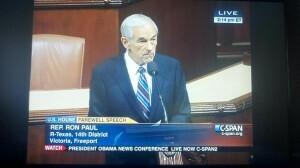 Editor's Note: The following is an excerpt from Congressman Ron Paul's final speech on the floor of the U.S. House of Representatives, "Farewell to Congress" delivered on November 14, 2012. A full version of this historic speech is available in booklet form in Campaign for Liberty's store. 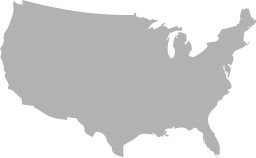 America now suffers from a culture of violence. It’s easy to reject the initiation of violence against one’s neighbor, but it’s ironic that the people arbitrarily and freely anoint government officials with monopoly power to initiate violence against the American people - practically at will. Because it’s the government that initiates force, most people accept it as being legitimate. Those who exert the force have no sense of guilt. It is believed by too many that governments are morally justified in initiating force supposedly to “do good.” They incorrectly believe that this authority has come from the “consent of the people.” The minority, or victims of government violence, never consented to suffer the abuse of government mandates, even when dictated by the majority. Victims of TSA excesses never consented to this abuse. This attitude has given us a policy of initiating war to “do good,” as well. It is claimed that war, to prevent war for noble purposes, is justified. This is similar to what we were once told that “destroying a village to save a village” was justified. It was said by a U.S. Secretary of State that the loss of 500,000 Iraqis, mostly children, in the 1990s, as a result of American bombs and sanctions, was “worth it” to achieve the “good” we brought to the Iraqi people. And look at the mess that Iraq is in today. Government use of force to mold social and economic behavior at home and abroad has justified individuals using force on their own terms. The fact that violence by government is seen as morally justified is the reason why violence will increase when the big financial crisis hits and becomes a political crisis, as well. First, we recognize that individuals shouldn’t initiate violence; then we give the authority to government. Eventually, the immoral use of government violence, when things go badly, will be used to justify an individual’s “right” to do the same thing. Neither the government nor individuals have the moral right to initiate violence against another, yet we are moving toward the day when both will claim this authority. If this cycle is not reversed, society will break down. When needs are pressing, conditions deteriorate, and rights become relative to the demands and the whims of the majority. It’s then not a great leap for individuals to take it upon themselves to use violence to get what they claim is theirs. As the economy deteriorates and the wealth discrepancies increase - as are already occurring - violence increases as those in need take it in their own hands to get what they believe is theirs. They will not wait for a government rescue program. When government officials wield power over others to bail out the special interests, even with disastrous results to the average citizen, they feel no guilt for the harm they do. Those who take us into undeclared wars, with many casualties resulting, never lose sleep over the death and destruction their bad decisions caused. They are convinced that what they do is morally justified, and the fact that many suffer just can’t be helped. When the street criminals do the same thing, they too have no remorse, believing they are only taking what is rightfully theirs. All moral standards become relative. Whether it’s bailouts, privileges, government subsidies, or benefits for some from inflating a currency, it’s all part of a process justified by a philosophy of forced redistribution of wealth. Violence, or a threat of such, is the instrument required and unfortunately is of little concern of most members of Congress. Some argue it’s only a matter of “fairness” that those in need are cared for. There are two problems with this. First, the principle is used to provide a greater amount of benefits to the rich than to the poor. Second, no one seems to be concerned about whether or not it’s fair to those who end up paying for the benefits. The costs are usually placed on the backs of the middle class and are hidden from the public eye. Too many people believe government handouts are free, like printing money out of thin air, and there is no cost. That deception is coming to an end. The bills are coming due, and that’s what the economic slowdown is all about. Sadly, we have become accustomed to living with the illegitimate use of force by government. It is the tool for telling the people how to live, what to eat and drink, what to read, and how to spend their money.